Big, family meals. Tables laden with food. Drinks flowing. It’s holiday season and a time for celebrating. But the holidays can be a stressful time if you are on a strict budget. When you are living very carefully on the money that you have, extra expenses can really be a struggle. There are some who go all-out on Thanksgiving and don’t really care to spend extra on this once-a-year occasions but remember that if you are putting money on a credit card to pay for your expenses you will regret it later on. You don’t want to be paying for your Thanksgiving meal in February. The best way to tackle the large expenses of the holiday season is to put aside money for holidays all year round. I have an “envelope” for holiday expenses which I try to fill every month. But even with saving, money is finite and holidays are expensive. So…. Serve soup. Starting a meal with a nice soup is a good way to fill up on something cheap and festive. You want your family and guests to fill up on the cheaper items first so that you can skimp on the more expensive stuff. Don’t get carried away and make a fancy, expensive soup with lots of ingredients! A simple cream of potato or zucchini soup is fitting start to an elegant meal but a very cheap and filling dish. Soup can also be easily frozen as leftovers (see #7). Serve bread and dips. A yummy (homemade) bread or rolls is a good, filling way to start the meal. Any plain bread recipe can be elevated with the addition of some roasted garlic or herbs. A simple tehina or hummus dip (can be homemade) to dip the bread in will get the meal started. Lighten up the sides. Many traditional side dishes are based on pretty cheap items- sweet potatoes, potatoes, stuffing etc. Cut down on the margarine, butter, salt and oil to make the vegetables less heavy. The cost savings may be minimal but the lighter version will be easier to swallow and will encourage guests to eat more of these vegetables. A light lettuce or tomato salad is another easy, cheap side dish. Shop around for the turkey and other main dishes. While it not exactly practical to shop around for the best deal on each ingredient- especially if you are cooking all week!- pick the most expensive or most used ingredient and find a deal on that. For thanksgiving, this will probably be the Turkey. If you save $1 dollar a pound on a ten-pound turkey, you will save $10. That is worth driving a little extra for! Keep an eye out for grocery stores offering coupons or deals on other more expensive ingredients like nuts, throughout the week. Cut down on drinks. Soda, punch, and juice add expense to your meal. Consider serving water or a homemade lemonade or sumac juice to cut down on costs and make your meal a little healthier. Some lemon slices or fresh mint in a pitcher of water make a festive addition to your table with very little cost. Sweet potato vs. pecan? While it may not be worth it for you to cut down on all expensive ingredients or dishes (Thanksgiving is one time a year, after all!) it may be worth it to cut down on the more expensive dishes on the menu. A smaller piece of pecan pie can be served next to a larger slice of sweet potato pie. The more expensive the ingredient- the more sparingly it should be used. Leftovers! It goes without saying (but we are saying it anyways)- save leftovers. Take the time after your exhausting day to properly pack up and fridge or freeze leftovers. Don’t leave all food to be eaten the next day. Freeze some dishes to keep for those days when supper is just not happening. Instead of ordering pizza, pull some leftovers out and you will be grateful you took the time to freeze it! Do you have any tips to cut down on expenses for the big meal? Share on Twitter or leave a comment below! This post is dedicated to that 14.5%. You know who you are. Or maybe you don’t. But maybe you can read this post and then you can have the amazing honor of lowering that percentage. These types of statistics are what led me to start my blog. Why is this different than other savings? Because when we talk about savings we usually are talking about money that you are investing in a way that will make you money. You want the money to grow. An emergency fund is not meant to be invested. You just want it there when you need it. This means that you want it easy accessible. Think about a pile of cash that you can pull out in case of emergency. You want it readily available Of course, a pile of cash is NOT a safe way to keep money (although having some ready cash is always a good idea) but that is basically the point. I personally do keep my emergency fund in a savings account that earns interest but it earns very little compared to other accounts and it has no penalty for taking the money out. Cuz life happens. Cars break. People get hurt. Medicine needs to be bought. Jobs get lost. People die. People get very sick. Crucial appliances get broken. The list goes on. The more catastrophic losses in life are usually covered by insurance- most people don’t have the cash to be able to cover rebuilding a house, for example but the smaller things in life have to be covered by you. Of course, covering an insurance deductible or co-pay can also be an emergency. The hardest thing about emergency funds is that the harder you find to save for it- the more you are in need of it. Think about it- if you are living paycheck to paycheck then you can’t actually afford ANYTHING else-let alone a flat tire. Once when I was going through a long period of under-employment I used my emergency fund to buy my son $20 worth of medicine. If you barely have the medicine to cover basic bills, then an emergency can really knock you down. Recently, there have been hurricanes and wildfire that forced many to evacuate. Having money to pay for transportation, for alternate shelter, for equipment to secure property, generators etc. can minimize the financial devastation that can be caused. In addition, having money gives you OPTIONS. For example, you can choose not to stay in a public shelter or you can decide to evacuate a if you are in a non-mandatory zone that is expected to be hit hard. Why can’t I borrow money for an emergency if I need to? Assuming that someone will lend you money (not always a given- even credit cards have a nasty habit of having pesky things such as credit limits or insisting on knowing that you have a way to pay them back so unemployment can get a card canceled) borrowing even small amounts of money from a private lender or credit card can spiral very quickly out of control. While you may get a bank-sanctioned loan for a low interest rate, usually an emergency would necessitate an unsecured loan that usually have very high interest rates and fees. The worst of these are Payday lenders who charge ridiculously high interest rates for small loans. If you have to borrow even the smallest amount from these kinds of lenders you may spend years paying off the interest. Unfortunately, sometimes small emergencies can cause a vicious cycle of borrowing to pay off other loans and falling deeper and deeper into debt- all for a really small initial amount! The best way to avoid this, (easier said than done) is to avoid the initial loan in the first place. You may be able to borrow from kind-hearted friends and family but everyone’s resources and patience are limited and they may not be able to lend you the money you need on the terms you need. After all, who says they have an emergency fund? Additionally, there is no quicker way to ruin a relationship than to borrow money that will be difficult to pay back. When weighing a good relationship versus saving money I would pick the good relationship. “Neither a borrower nor a lender be” but I would much rather be the lender and I certainly don’t want to be the borrower. Where I should I keep this money? I personally use a CapitalOne360 Savings account for my emergency fund but there are many other $0 fee banks that you can use as well. Only use a bank that doesn’t charge a monthly service fee or withdrawal fee (or that can be easily waived-such as signing up for e-delivery of statements). There are so many banks that don’t charge fees that it is really stupid to be paying for a bank accounts. Just start. Take whatever money you can and open an emergency fund today. If you have a bank account that doesn’t require a minimum balance (no reason not to), then you can put $5 in and get started. Look around and see if any banks are having any promotions for opening an accounts. I personally started my CapitalOne360 account when they were having a promotion where they gave my $100 for starting an account with $100 in it. That doubled my saving immediately and gave my the push I needed to continue filling my account (see it’s easy!). Savings should come out of EVERY PAYCHECK. I put 10% of every paycheck into my emergency fund. It may take you a really long time to actually build your emergency fund, especially if emergencies crop up while you are trying to build it. If that happens- take as much as you need out of your account to cover it and then start over. It took me 5 years (!) to finally have $1,000 in my account. How much should I put in my emergency fund? Your first goal should be to have $1,000 in your emergency fund. Why that number? Its nice and big and round and not too big to be overwhelming or out of reach. Dave Ramsey recommends it and it seems like a nice amount, so why not? I have found that $1,000 is about the amount that would be needed to cover a broken appliance, a deductible, or car trouble. If you have an emergency that is more than $1,000 (it happens) then pay what you can- at least you’ll have that much less interest to pay! The ideal level of emergency fund is a full 6 months of living expenses. The theory being that if you are unemployed and bringing in absolutely $0 income for 6 months you would not be evicted or starved. Its a large number and not an exact science so you can make your own calculations but it a good goal to start with. After you have a fully-funded emergency fund you would start investing more in other more sophisticated accounts or assets- so theoretically you could always liquidate those if things get really hairy-but that is a long, long way in the future. When do I use my emergency fund? Well, you can pray that you never have to but chances are something will come up that you will have to dip into that fund. An emergency is a “serious, unexpected, and often dangerous situation requiring immediate action” (dictionary.com). An emergency is unavoidable. An emergency cannot be pushed off. An emergency should not have been foreseen in advance. Obviously, its your money and you can do what you want but keep in mind that these should not be considered emergencies: Regular Bills, vacation, Holidays (you knew they were coming), events such as weddings or babies, or anything you can save up for. 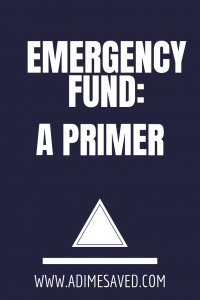 Having an emergency fund is one of the smartest things you can do for your financial stability and one of the concepts on which all personal finance experts agree upon Click To Tweet (although you may have some disagreement on the size, location etc). Don’t let an emergency derail you life and your future. Don’t let a small thing ruin your life. Don’t be stressed about how to pay for your kid’s medicine. Have a small piece of mind that you are doing your best to protect yourself and your family from financial disaster. Read the Basic Guide to Budgeting and Personal Finance. Savings. 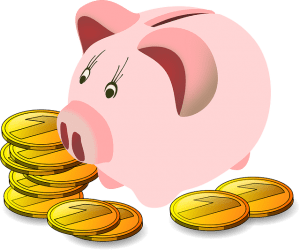 We all want lots of money in savings but its not so easy to actually save the money. In fact, it’s quite difficult. There is a reason why so many Americans are living paycheck to paycheck. I get it. I am a low earner myself, and I have been unemployed. I don’t have too much money saved but I do try to make it a priority. 3 Tips to Boost your Savings- but be warned! There are no shortcuts! Click To Tweet These are not quick or easy. In fact, there is no really quick and easy way to save money. It takes hard work and discipline. There are no short-cuts. Trust me, I have scoured the web to look for them and asked many, many people. Anyone who says that there is, is either lying to you or trying to sell something. That being said… what can you do to boost your savings and your savings rate? In order to save money you have to set systems in place. When you are following a set of rules that you make for yourself it is easier to make sure that you save. So I recommend having a specific amount of money that is set aside each month- this can be wither a dollar amount or a percentage of your paycheck, ex 20%. This amount gets taken from your paycheck immediately! If you get paid by check or direct deposit- the minute the money hits your account you transfer it to your savings account. Many accounts allow you to do automatic deposits so you can set those up to withdraw money from your checking account and into your savings account the day you get paid. If you get paid in cash, immediately separate the savings portion and place it aside. Don’t go shopping before having the savings portion in a separate envelope that you won’t spend. Tell yourself that it is not your money. It belongs to your savings account- not to you. Dream! Your state of mind is very important when it comes to saving. If you feel like you are depriving yourself in order to save then you are more likely to keep spending the money instead of saving. If you allow yourself to dream and imagine what opportunities your savings will allow you later in life you will have an easier time putting that money away. Think, write down, discuss what financial security can do to your life. This will help you feel like you are working towards something as opposed to just denying yourself something today. Celebrate small goals! Set small achievable goals for saving and then celebrate when you reach them. You can make a visual aid to help you stay on track and celebrate those small successes! Visual aids are great because you can really SEE what you are doing. You can color, have a physical jar or chart etc. Many online bank accounts have visual trackers as well that can really help you picture your goal. Pinterest and Instagram have some great examples of visual aids that people way more creative than me have come up with! I put $5 a month into my retirement account. Why, you ask? To create good financial habits!